The Growth Engine is your automated digital marketing solution. By combining original, exclusive content with our proprietary software, the Growth Engine is like having the world’s best death care marketing team working around the clock for your business... for pennies on the dollar. Finally, the key to turning Facebook into business. The Growth Engine grows your business effortlessly by reaching your community where they spend time, capturing contact information, and nurturing them until they are ready to take action. It’s got all the content you’ll ever need, which means you never have to write a single post or email. Our proprietary software delivers the content to the right people at the right time, so you never have to lift a finger. 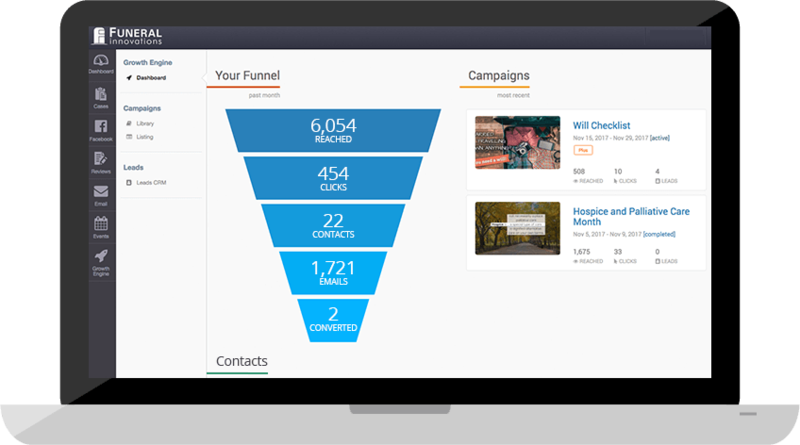 With Growth Engine managing your marketing funnel, you can sit back and spend time doing what you do best: serving your growing customer base. Reach the 79% of adults who are on Facebook with your message. The community member sees your engaging post on Facebook, building familiarity and trust with your brand. 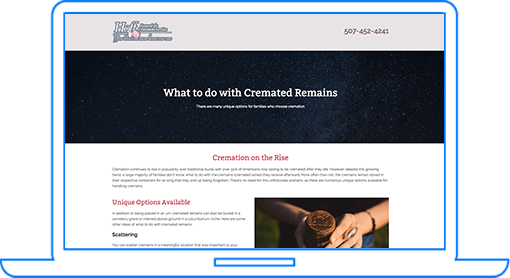 The community member clicks on the link in the Facebook post and moves to a webpage, learning more about cremation memorialization options and other relevant topics. 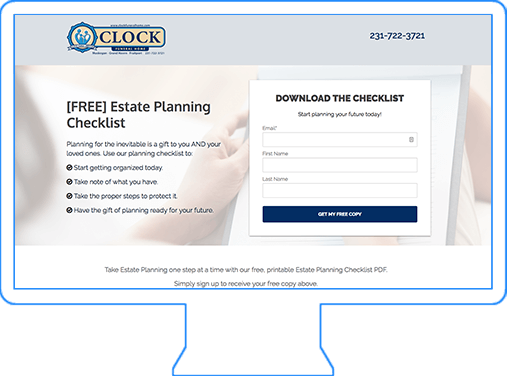 While on the webpage, the community member provides their contact information to receive an estate planning checklist. Heat up your contacts, and stay top of mind, with relevant follow up emails. The community member receives emails from your firm providing engaging and educational information about the benefits of pre-planning. Get the first call when your leads are ready to take action. 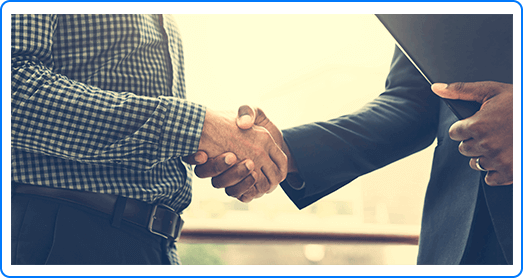 When the community member is ready to take action to pre-plan, they call the firm who’s been consistent with them - yours! 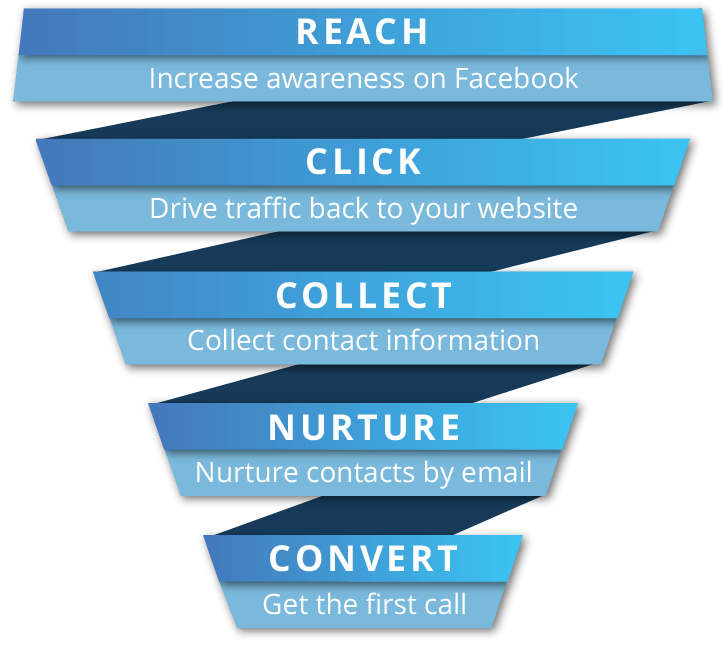 The Growth Engine uses campaigns to find people in your community who have interest in a topic, collect their contact info, and further engage them on that topic, constantly filling your funnel. 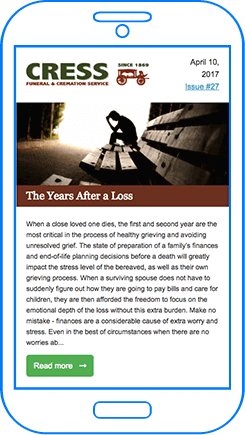 Each campaign is easily deployed at the push of a button, bringing you contacts and business on whatever topics best fits your funeral home or cemetery. What Are My Funeral Options? The Growth Engine is turn-key and all-inclusive, meaning everything your funeral home needs to succeed with digital marketing is there, and JUST WORKS! I’d like to get occasional emails with digital marketing tips. 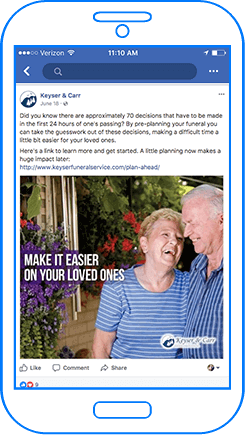 "After years of being on Facebook, I started to think it wasn’t possible for it to turn into business for my funeral home. Now, with the Growth Engine, not only am I building a community around my brand and seeing an increase in business, I’m clearly seeing results at every step of the way." "Greg and Zack are great to work with and extremely helpful with marketing ideas and listens to our ideas. In my opinion, they are both geniuses... It was a great choice and I am so glad that we partnered with them. They do feel more like a partner than a vendor encouraging us to meet our marketing goals." With 81% of people only calling one funeral home when they’re in need, it’s vital to your funeral home to get that first call. Funeral Innovations gets you that first call.